When selecting your shipping preference, please keep in mind of our printing schedule. Our printing schedule runs Monday - Friday, Excluding National Holidays. We do not print over the weekend. Standard Product Projects need to be paid for and approved by no later then 11:59am eastern time. All Next Business Day orders submitted on Friday before the cut off time will be available for pick-up or will ship on Monday. All orders submitted on Friday after the cut off time will process to print on the Next Business Day. 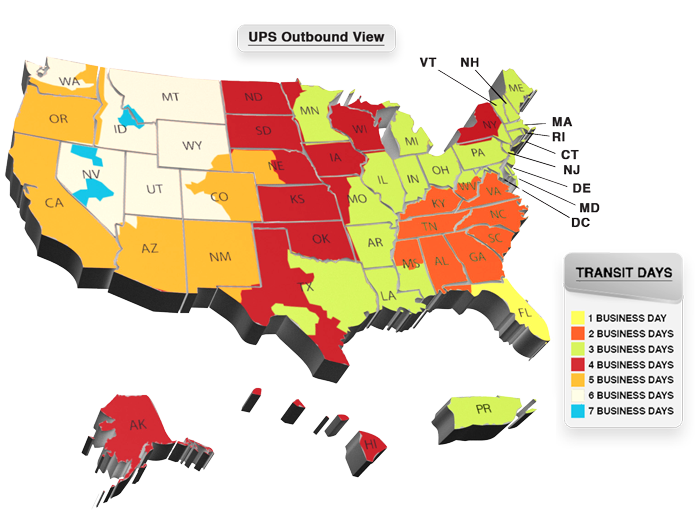 All UPS Shipments can be tracked at www.ups.com or contact UPS by phone at 1.800.742.5877.
International shipments using American Airlines Cargo arrive within 48 hours after your order has been marked shipped. American Airlines shipments are not available for door-to-door delivery and MUST be picked up at your local designated airport. American Airlines offers directions to their pick up locations and shipment tracking online at: www.aacargo.com or contact American Airlines Cargo directly by phone at: 1.800.227.4622. Ordering from the Caribbean, the Bahamas, or any other part of the world? NO PROBLEM MON! We use select air carriers and freight forwarders to get you your prints by when you need them. The Cost for Delivery to a freight forwarder within Miami-Dade County is $35.00. Freight deliveries outside of Miami-Dade County would require a custom quote.